This last weekend, we took Genevieve out to her first Stitches West. I was thinking about this picture, and what I kept coming back to is that half of me came from Mom, and that Genevieve is half me. It completely blows my mind. Speaking of Mom, check out what a great job she did on my hair! After a lot of discussion about parenting and identity, Mom facilitated the re-pinking. It's stupid and superficial, but I just didn't feel like myself as a brunette. After Mom did the bleach and color on my hair, we went to get it cut, and Suzy the Stylist declared that I looked like myself again, too. Nothing like a Mom to make sure you don't lose yourself, right? Stitches was fun; it was a completely different experience with Genevieve. We did a lot more sitting and a lot less partying, but you know what? It was a much more restful weekend. And we can always party when she's older. What I *will* say is that she LOVED staring at all the colors. She can't help it; it's in her genes. This warms my heart! Can't wait to hear your voices again. Give us a little taste of Genevieve too if you can! Your hair looks great! Little Genevieve looks alot like your Mom, and looks quite comfy, too. I love the picture of the three of you... lots of love, ladies! What a wonderful post--welcome back--you've been missed! Such a wonderful picture of 3 beautiful ladies. Looking forward to hearing your voices again very soon. That's a snap for the photo album. I can see a lot of both you and your mom in sweet little Genevieve. And your hair looks fabulous! Beautiful picture of all three of you. 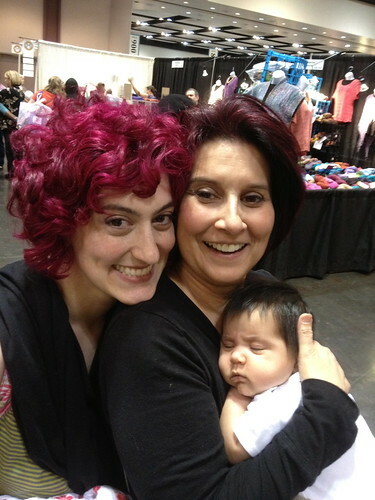 Your hair looks lovely, and Genevieve is adorable! Glad to see you back to pink, Jasmin! It kind of amazes me that someone can go through something as life-changing as making another human being and come out of it as the exact same awesome person. Also, as someone roughly in your age group and surrounded by people reproducing NOTHING has given me baby fever except seeing your photos of Genevieve, and I love her name. Beautiful picture of 3 generations! Baby G. looks like Oma! I love your three generations picture! You hair looks fantastic. The three of you look so calm and relaxed and happy. What a good looking family you are. I love this picture of you guys. If you travel to any of the Oregon Festivals this year I hope I get to see you again. Until then, enjoy.